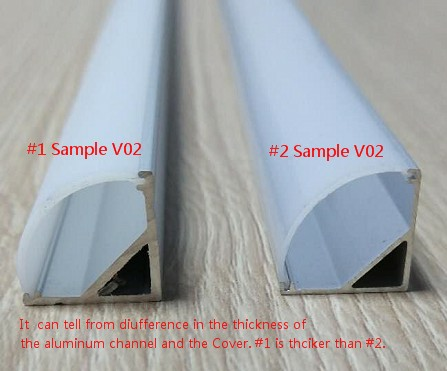 The Factors That Cause the Pricing Difference for LED Aluminum Channels. The Weight of Aluminum Profile ： the heavy one use more AL the raw material for channel and more PLASTIC the raw material for cover, some use less the material, the heavier one cost much more. Below is an example of two different V02 1Meter Sample. You can see that the #1 Sample has thicker Aluminum Channel and thicker Cover. And when measured by the scale, we can tell the #1 sample is 51.5g heavier than the #2 sample. 40% heavier! The One uses more material is tougher and not easy to be bent or damaged, and can take more outside weight.